La Galerie Nationale is hosting a retrospective of well-known Lebanese artist Katya Traboulsi’s works over the last decade. The show highlights the artist’s creativity, versatility and positive spirit through paintings, sculptures, assemblages and her experiments with a variety of other media. Traboulsi was born in Lebanon in 1960. As an artist, she has embraced all forms of art, and a variety of media, giving herself the space to express her thoughts and feelings with complete freedom. She is known for her vibrant palette, which reflects her determination to defy the way her life and that of her generation has been stolen by the war in Lebanon. The artist currently lives in Beirut, but was based in Dubai for more than two decades. She has been running the Atelier for young talents in Dubai and Beirut since 2000. She has also published two books — “Of Others” in 2011, and “Generation War” in 2013. In 2015 she was commissioned by famous pen maker Montegrappa to design the limited-edition Kahlil Gibran pen and the Calligraphy pen. She has also curated major exhibitions such as “Generation War” for the 2013 Beirut Art Fair and “Pictorialism” in Dubai. The show presents artworks from various projects that she worked on between 2005 and 2015. Each series is quite different in terms of the themes, and the media and techniques used by the artist. Yet they all have the distinct Traboulsi look, with her signature bright palette. The earliest artworks in the show are two paintings from her “Impact” series done in 2008-09. Both paintings feature splashes of paint, but while one is done with grey and black acrylic and oil paint on canvas, the other is an explosion of bright yellows and reds on Plexiglas. “These paintings depict the impact of bombs and bullets on the walls of Beirut. Everywhere in Beirut we have buildings with marks that look like this. I transferred the dramatic sight on to my canvasses because every bomb mark and bullet hole on the walls of the city is a powerful moment and has a story to tell. I did a series of 30 paintings where I deliberately transformed the darkness and the negativity of these vestiges of war into the positive energy of bright colours,” Traboulsi says. In stark contrast is a figurative, acrylic on canvas painting, also from 2009, titled “Encounter”. The Cubist style work done in shades of grey features a couple with their bodies intertwined to look like one, and with multiple faces. “This work is about the positive and negative aspects of a relationship, and features some of my favourite motifs such as a bird, symbolising freedom, and a tree, which represents stability and fertility,” the artist says. A striking set of lenticular works mounted on light boxes, from 2012-13, speak about Traboulsi’s interest in experimenting with different media and techniques to express her ideas. In one piece titled “Love”, an X-ray-like image of a skull, with the pulsating neurons and other details of the interior clearly visible, is superimposed on a pink background with the word “love” inscribed on it. 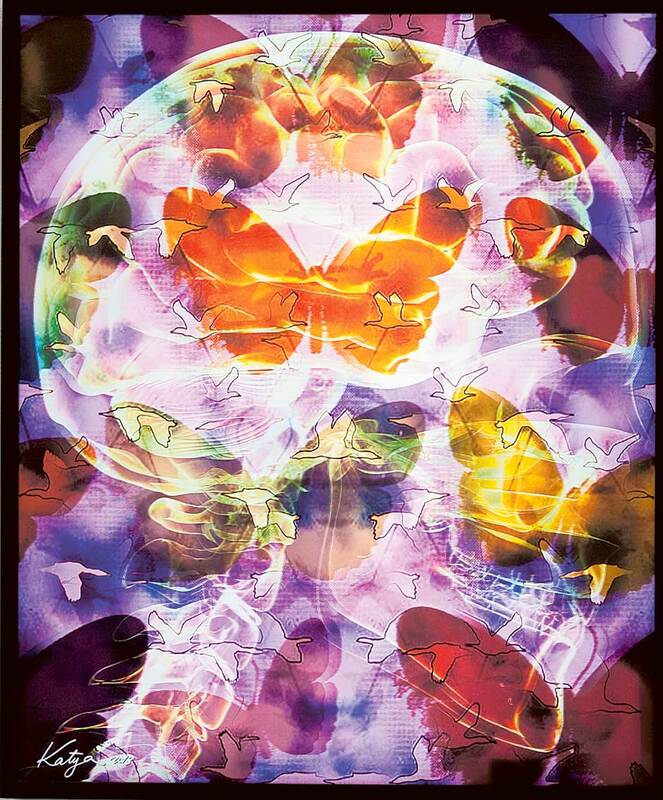 In the other work titled “Freedom”, colourful butterflies and birds are seen fluttering inside the skull. “I wanted to work with this medium and the light box to create the feeling of an X-ray and to show the depth within. Our body is like a perfect machine and the most beautiful of God’s creations, and I have always wondered why people are scared to look inside. In this project I showed the beauty inside and the meaning and importance of each organ. I put the word ‘love’ to tell people, especially women, that you must love your body and the soul within, and not be afraid to do so. Love is the most powerful energy and if we have this nothing can stop us in life. And in ‘Freedom’ the birds in the brain symbolise our need for freedom, while the butterflies allude to the fragility of our mind and body. In these works there is a coming together of the memory of the past, present and future,” the artist says. In “Moucharabieh”, also created in 2012, Traboulsi has filled her canvas with various symbols and motifs to form a complex pattern that she compares to the latticed windows or “mashrabiyas” in Islamic architecture. “We all have a central core which is our truth; but we are surrounded by the chaos of life, which is like a ‘mashrabiya’ that keeps us from seeing the truth and doing what we really want to do,” she says. Recent works in the show include “Delirium” — a painting where the artist allowed her feelings to flow spontaneously on the canvas resulting in a colourful composition of figures and symbols; and a series titled “Accumulation”, featuring framed arrangements of her brushes and the plastic plates she uses for mixing her colours. These tools of her trade carry the remnants of the paints she has used in the recent past and are like self-portraits of the artist. “I love every brush and plate I use and can never throw them away. They are filled with memories of what we have gone through together and have a lot of meaning for me, so it made sense to give them a new birth as works of art,” she says. 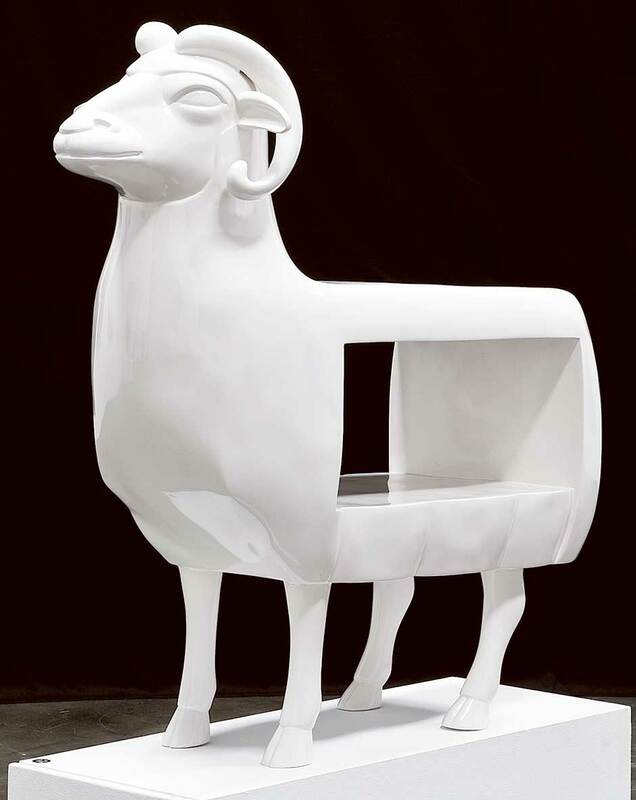 Standing serenely in the centre of the gallery is a life-size sculpture of a sheep, which represents another facet of Traboulsi’s art. In a typical Traboulsi touch, there is a shelf carved out in the body, making it a functional piece of art. “This project was inspired by the people of Lebanon. They are like sheep, blindly following their leader. So I created this white sheep from fibreglass and called it, ‘I am not a sheep’,” she says. The retrospective of Katya Traboulsi’s works will run at La Galerie Nationale, Alserkal Avenue, Al Quoz, until July 31.